MANILA – Two Americans wanted by US federal authorities on assault and battery chargers were arrested in separate incidents in Baguio and Mandaluyong City, the Bureau of Immigration said. 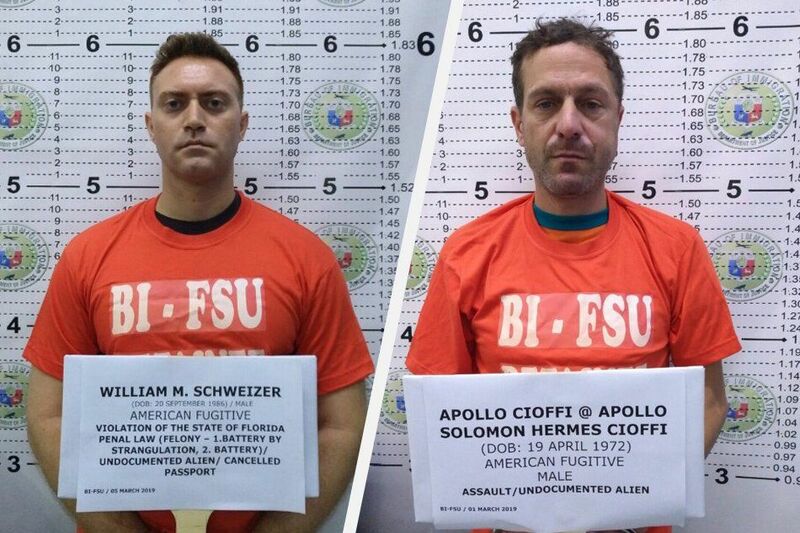 The suspects, Apollo Cioffi and William Schweizer face deportation after they were captured by elements of the bureau’s Fugitive Search Unit, BI Commissioner Jaime Morente said. Cioffi, 46, was arrested on March 1 inside a mall in Baguio City. He is wanted by authorities in California for assault. A superior court in San Francisco reportedly issued a warrant for his arrest. Schweizer, 32, was nabbed inside his unit at the Tivoli Garden Residences in Mandaluyong on March 5. He is the subject of an arrest warrant issued by a circuit court in Broward County, Florida after he was charged with felony battery by strangulation. Cioffi had been in hiding in the country since March 10 last year while Schweizer has been in the Philippines since July 2015. Cioffi, 46, was arrested on March 1 inside a mall in Baguio City. Don't tell them. Maybe the pulis can just go round up everyone wearing those shirts. Methinks it's nigh about time I stopped wearing my orange shirt! sometimes they act a bit surprised and ask why do you want an orange shirt. I say it's visibility. It's the best color for people being able to see you on a motorbike. if they don't have an orange one, I get a yellow one. I would not be getting released, I would die there. Literally.